Project participants Bluesmart to develop “the world’s first smart suitcase” reported that the total fees of funds to translate ideas into action 40 times higher than the originally scheduled amount. About suitcase Bluesmart we had once told. Recall that this travel bag on wheels stuffed with electronics, responsible for a variety of functions. In particular, there is a built-in receiver GPS: it will allow the owner through the accompanying mobile application at any time to determine the location of the luggage. 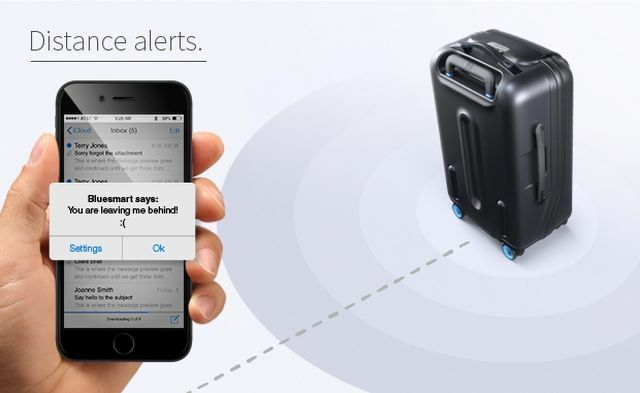 Set an alarm that is activated when the distance to the suitcase exceeds the limit. Bluesmart makes it easy to know the weight of its contents – is responsible for this built-in encoder knob. Thus, it is possible at any time to find out whether the load weight set Airport transportation regulations. Inside the suitcase integrated lithium-ion battery: via USB, you can recharge your gadgets right on the road. It is alleged that the stored energy is enough on average six recharges your smartphone. Finally, Bluesmart provides ample capacity to collect statistics. Through the mobile app, you can view the visited city, inquire about distance traveled, time travel, and so on. Initially, the issue of Bluesmart project participants hoped to raise $ 50 thousand., But the total amount of more than $ 2 million. Most of it – $ 1.3 million – has managed to attract via kraudfandingovoy campaign on Indiegogo. Now you can order a suitcase for $ 280, but soon the price will increase to $ 400. Deliveries are to begin in August.